Continuing a holiday tradition that began in 2006 with “A Great Big Sled,” The Killers released their annual Christmas song today. “I’ll Be Home For Christmas” is a cover of the holiday classic, written by Kim Gannon and Walter Kent and famously recorded by Bing Crosby in 1943. Written to honor soldiers who were spending the holidays overseas defending their country, the song has since become a Christmas standard. This time around, The Killers eschew killer Santa Clauses, Southwestern dance parties, and anthropomorphized lumps of coal for a more traditional outing. 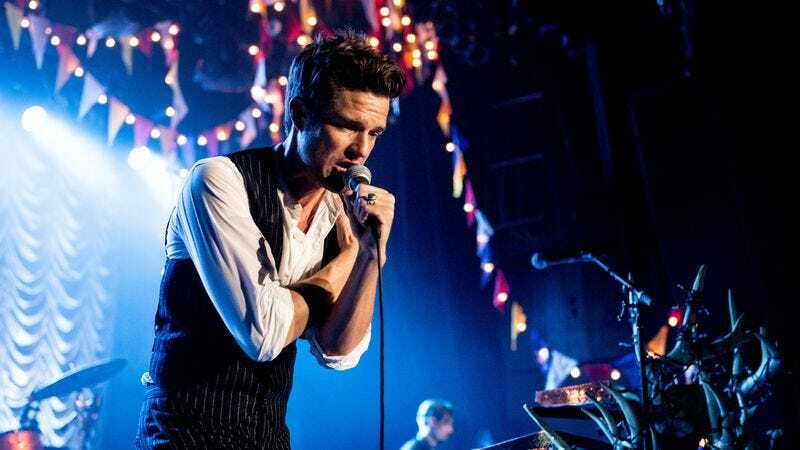 The recording features Brandon Flowers sharing vocal duties with his fourth grade science teacher, Ned Humphrey Hansen. Flowers introduces the song with a spoken word story of his family moving from Henderson, Nevada to Payson, Utahn where he first met Hansen. Hansen sang “I’ll Be Home For Christmas” a capella to Flowers’ fourth grade class and it struck such a chord with the singer that he brought him along for this year’s holiday release. “I’ll Be Home For Christmas” is available for download now, with all proceeds benefiting Bono’s (RED) charity. Also available for download is Don’t Waste Your Wishes, an 11-song collection of The Killers’ holiday output featuring Elton John, Richard Dreyfuss, and Mariachi El Bronx that will be released as a limited edition CD on December 9, available exclusively through the band’s website.